Lala Anthony has made it very clear that though she is the wife of a basketball star, Carmelo Anthony, she does not look to a man for validation. There are many of us women who want a rich lifestyle, and believe that dating or marrying someone rich and famous will get them there. There is absolutely nothing wrong with marrying up, but it can be dangerous to be totally dependent on a man. 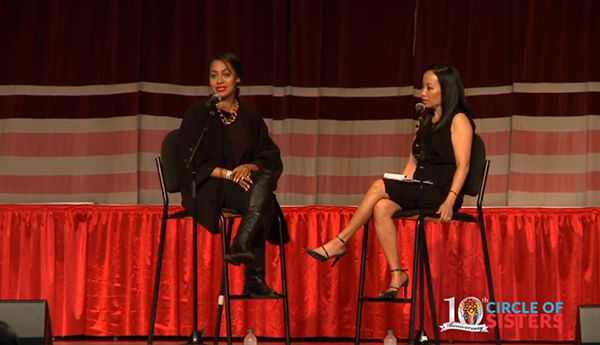 Speaking at the 10th Anniversary of the Circle of Sisters Expo in New York City, she talked to the women who attended about how important it is to have your own thing going on that defines you rather than the career or riches of your man. I’m not being negative but it’s something to be said that, your man knows that if something goes down, you would be okay if you had to walk away. And that’s powerful. That is powerful. So it’s just something to think about. I say, come into a relationship with your own. Everyone is not meant to run a Fortune 500 company, but just have something that you own. A clothing line, a hobby, something that you’re passionate about so that your whole world doesn’t revolve around a man. That’s not a good thing. For me the whole ‘Basketball Wife’ thing, it’s tricky. I battle with that title because sometimes I go, you know, ‘I’m not a basketball wife, I’m not a typical basketball wife,’ but in essence, I am a basketball wife. It took for Gayle King to sit me down and go, ‘You know, you shouldn’t look at it as such a negative title. It is what you are,’ and I respect my husband and I want to be a great wife and be there for him, but I also want to have my own career and do my own thing. Which I think is really cool. I think when you bring something to the table, and I say this to all the ladies out here, it just makes you that much more attractive to that man that you’re with. It just makes you that much more valuable. I was the girl who said I would never date a basketball player. I’m like, ‘I don’t want to do that.’ Someone that is traveling all the time and gone, but it just happened. And it’s just funny like, when you don’t go after certain things, how they happen. And in ‘The Love Playbook,’ I talk about working on yourself. Why are we chasing these guys and giving them so much power? When you’re great within yourself, you’re going to attract so much amazing energy and I don’t need a man to make me feel like I’m worthy or I’m worth it. I don’t need that. My husband, I love him and he complements me, but I don’t need that to make me feel like ‘I’ve made it,’ or ‘Now my life is where it needs to be.’ I don’t need a man to validate me in that way. For the women out there, especially the young women, it’s so passionate for me to say, ‘Find your own way.’ I’m just finding that so many women feel they have to be validated by a man or a guy and they go through so much destruction because of that. Let’s focus on being happy with ourselves and knowing that we are enough and we don’t need a man to validate us. That’s my message for today and that’s what speaking on my heart right now!